I’m so pleased with these shams. They fit my pillows perfectly and give me the look that I was hoping for. These exceptional quilted Euro shams are made from 100-percent sateen cotton with plush polyester fiber fill for superb, luxurious feel. Perfect for any bedroom aesthetic, this pair of shams come in one of three crisp, neutral colors for optimum versatility in your home. 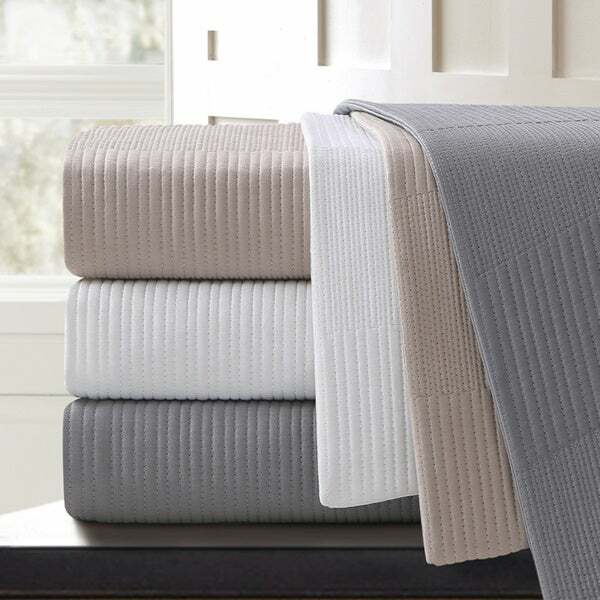 Machine washable and easy to take care of, this set is the perfect no-nonsense addition to your bedroom ensemble. I was looking for white euro pillow shams at a reasonable price, and these fit the bill. I washed them and tumbled dry before putting them on the pillows. They didn't appear to shrink, and they came out fine from the dryer. They fit well - no loose corners. The quilting is only on the front of the shams, but that's all you need. The back is plain old cotton (or cotton blend). Overall, very happy with the purchase. If you're looking for fancy shams, this is not for you. For basic, machine washable shams, these do very nicely. These shams are simple and clean. Nice material, not cheap, which holds up after several washes. If you have 26 X 26 inch, standard Euro pillows that aren't bulky and are what I have, then the fit might be a bit loose. I still love the shams and the look, but after I upgrade to 28 x 28 inch Euro pillows, the fit will be perfect. Because my pillow inserts fit loosely with many Euro shams, I've decided to upgrade to 28 x 28 inch pillows. I've read from many sources that an increase in pillow size remedies the loose fit issue. To conclude, I definitely recommend these shams if you're in the market for some good, well constructed, and affordable Euro shams. They look beautiful with the Echelon Home Echelon Sonoma Quilted Cotton Coverlet. A really, nice fresh and modern look. I am using the set for summer. I really like these euro shams. Nice construction with a zipper, a quality backing, and done in heavy weight cotton. The geometric pattern goes great with quilts like the Laura Ashley florals I have (I got white). You will not be disappointed in this purchase. I ordered this pair of white Euro Shams and the quality of fabric is lovely. The white can be used in any room. I'm very happy with this purchase. Very well made. Quality product made from quality materials. We are looking to purchase additional items in anther color for the spare bedroom. Love them! Very pleased with these shams so far and they look great on my bed. I purchased the gray ones and the color is just what I hoped it would be. I've washed them once before putting pillows in them and the stitching and color so far has remained intact. These shams are very thick and feel like they are high quality. We were looking for a 26 x 26 sham to add to a daybed. Purchased in taupe, this one was a very nice choice. I really liked the clean lines, texture, and neutral color. As anyone who buys euro shams knows, those suckers are pretty expensive. I bought these hoping I'd get a good deal and indeed it was worth the risk. These shams look exactly as pictured and the colors are neutral enough to go with all types of bedding. For the price, this set of 2 are well worth it. I bought these to go with the Nautica Tideway quilt set. They match perfectly. I like the pattern on these, they are very soft. I used 28X28 pillows to go in these to fill them out and they were perfect. Ok quality for the price and will go well with my bedding. They are as expected. Cozy looking and pretty, however the seem immediately ripped a little bit when I put a Euro pillow in. I ordered the grey euros and the color is lighter than what is pictured. The stitching makes them look more expensive than they are. Pretty nice , a little shiny not so much matted. Love the look! Can easily mix different textures with the shams. "Can you please tell me when you will have the taupe color shams back in stock? I want to get a king size quilt and matching euro shams in taupe, but here are none in stock. Thank you!" I needed something to match the Laguna Euro Shams as there was only one set left of those and I needed four shams. I figured the grey color would be identical on all these items.